Premieres on Netflix 16 Jan.
Boots Will be Donned and Buckles Will be Swashed as Puss in Boots Protects the Mystical, Adventure-Laden City of San Lorenzo in an All-New Netflix Original Series from DreamWorks Animation. The Adventures of Puss in Boots finds the world’s most famous feline fortune-hunter in the hidden city of San Lorenzo, a mythical land that is invisible to the outside world thanks to a magical spell that protects its quirky inhabitants – not to mention its wondrous treasure. When Puss in Boots accidentally breaks the spell, he must do more than fight off an endless legion of invaders and marauders … he must become a legend. With a sweeping, epic visual flair and extraordinary quests in each episode, The Adventures Of Puss In Boots combines adventure and comedy with the quick-witted, nimble-footed style that is as synonymous with its hero as his namesake boots. Its voice cast is led by Eric Bauza (The Book of Life, Turbo FAST) as Puss in Boots, along with Jayma Mays (Glee, Getting On), Laraine Newman (Saturday Night Live, Doc McStuffins), Joshua Rush (Mr. Peabody & Sherman). Throughout the series’ first season, recurring and guest-starring voices will include Emmy® Award-winning actor John Leguizamo (Chef, Ice Age), Danny Trejo (Machete, From Dusk Till Dawn), Maria Bamford (The Legend of Korra, Adventure Time), John Rhys-Davies (Raiders of the Lost Ark, The Lord of the Rings Trilogy), Robbie Rist (Teenage Mutant Ninja Turtles, The Brady Bunch) and Jim Cummings (Shrek, Winnie the Pooh). In addition to the five episodes of The Adventures Of Puss In Boots that premiere on Jan. 16, new episodes will debut throughout the coming year. 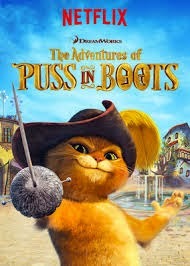 The Adventures Of Puss In Boots is the latest in a rapidly expanding list of original series that DreamWorks Animation is creating for Netflix. The DreamWorks Animation lineup on Netflix also includes Turbo FAST and All Hail King Julien and soon will grow to encompass a brand-new season of DreamWorks Dragons and the adventure-laden DinoTrux.